WASHINGTON — Icy roads caused a plethora of traffic troubles throughout the D.C. area Friday morning, after slush from Thursday’s wintry mix refroze and encased many roads in sheets of ice. Among the most serious traffic issues Friday morning: Parts of the Chain Bridge Road — one of the main routes into D.C. from Virginia — iced over and were closed off by authorities for nearly two hours at the heart of the morning commute so crews could salt the bridge. Road conditions, especially in Virginia, were a complete mess early Friday. Overpasses, turn lanes and on- and off-ramps were transformed into the equivalent of ice-skating rinks. Authorities reported numerous spinouts and crashes and were urging drivers to drive cautiously. 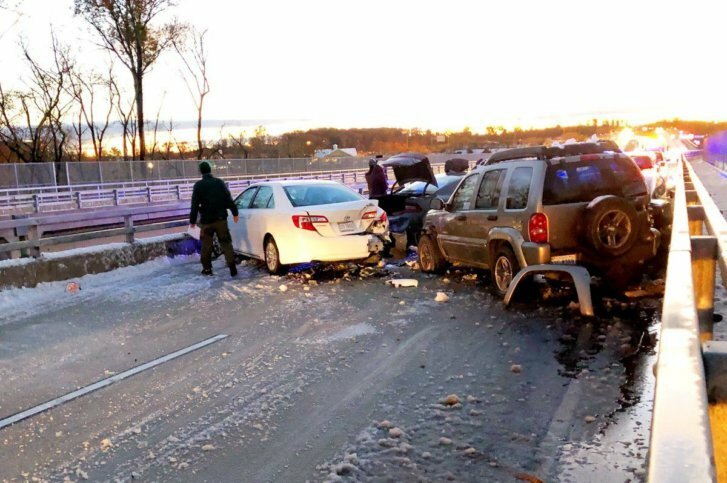 On Route 28 in Virginia at the Bull Run Bridge, icy conditions caused numerous crashes, leading authorities to block traffic in both directions. Lanes have since reopened, but significant delays persisted both ways on Route 28 for drivers trying to get between Manassas and Centreville. Virginia Route 7/Leesburg Pike at Virginia Route 267/Dulles Toll Road was also closed because of icy conditions but has since reopened. About a dozen cars were involved in a chain-reaction fender-bender on an icy overpass on the Gloucester Parkway in Ashburn, Virginia, early Friday morning. Nobody was hurt in the crash. The icy conditions weren’t confined to Virginia: In Maryland, a Howard County Fire and Rescue truck that had stopped for a minor collision on Interstate 70 just past Route 97 was struck by another car. The driver of the car was taken to the hospital with injuries that were not life-threatening, authorities said. 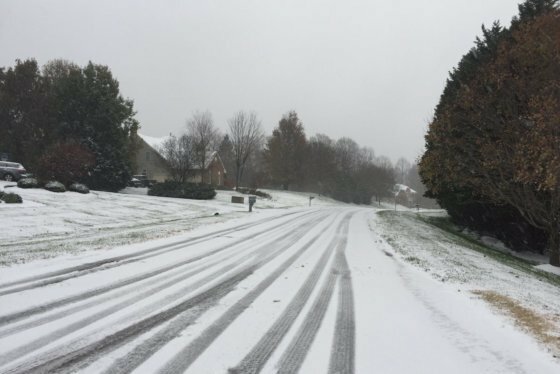 A number of school systems announced delays for Friday, as the region recovers from the first snowfall. In Virginia, school systems in Falls Church City and Alexandria City, as well as Arlington, Fairfax, Loudoun, Prince William, Stafford and Fauquier counties opened two hours late. Schools in Frederick County, Maryland, also opened on a two-hour delay Friday morning. See the latest delays and closures on WTOP’s Closings and Delays page. A flood warning is in effect until 10:30 a.m. in Fairfax and Prince William counties in Virginia. Flooding is occurring in Bull Run near Manassas Park. The Sudley area of Prince William County may also experience flooding, according to the National Weather Service. The weekend and much of next week is expected to be chilly, but without all the precipitation Thursday brought. Thursday’s wintry mix caused trouble on the roads all through the day. Accidents stacked up all over the region, and the gradual changeover to rain wasn’t making things much better, especially north and west of D.C.
Snowfall totals Thursday ranged from 8.5 inches in Martinsburg, West Virginia, to 1.4 inches at Reagan National Airport. BWI Marshall Airport saw a total of 1.7 inches and Dulles International Airport had 3 inches. Storm Team 4 meteorologist Steve Prinzivalli said that some 6 inches of snow accumulated in the northern and western suburbs. There were also reports of icing in areas just outside the D.C. region, with the Shenandoah Valley measuring 0.25 inches of ice. The conditions, and the people driving in them, caused havoc Thursday on area roadways as well. WTOP’s Abigail Constantino, Teta Alim, Rick Massimo, Jack Moore and Will Vitka contributed to this report.